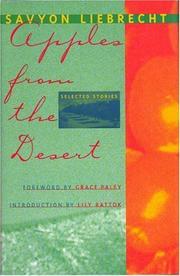 Apples From The Desert ($19.95; Aug. 24; 240 pp. ; 1-55861-190-8): A fine collection of 12 thoughtful and moving stories drawn from the previously published work of an Israeli writer whose dominant concerns are her country’s indifferent suppression of women, embattled relationships with its Arab neighbors, and burdensome memories of the Holocaust. In such skillfully dramatized conflicts as her title story’s portrayal of a lonely mother unhappily enlightened by her daughter’s fulfilling life on a kibbutz, and the tensions between a selfish bride-to-be and her elderly grandfather’s continuing imprisonment by the concentration camp he survived decades ago (“Hayuta’s Engagement Party”), Liebrecht creates images of a volatile and troubled culture that are often worthy of comparison with the fiction of her great contemporary Aharon Appelfeld.